Snobby Real Saab enthusiasts will claim that the post 90s GM based Saab cars are little more than global platform junk hiding under the ancient symbol of the mythical Scania-Vabis Gripen. But, they do offer a cool looking alternative to the bland GM junk from the early 2000s. 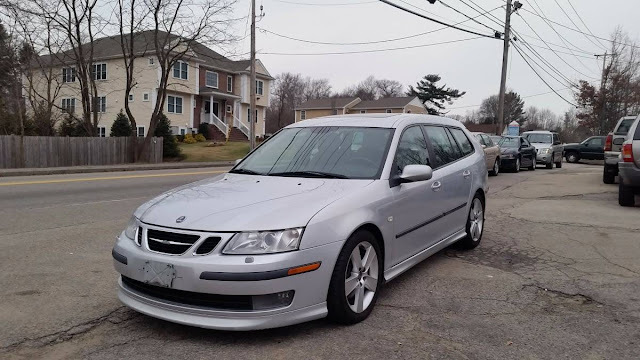 Find this 2006 Saab 9-3 Aero Sport Combi offered for $5,995 near Boston, MA via craigslist. Tip from Art. The 9-3 was built on GM's global Epsilon platform (Opel Vectra, Cadillac BLS) and is a handsome wagon in a clean Audi-like sense, but it still maintains key Saabness. Quirky, born from jets, made of moon cheese...whatever, this Saab is powered by a 2.8 liter turbocharged V6 mated to the front wheels that puts out 250 horsepower. 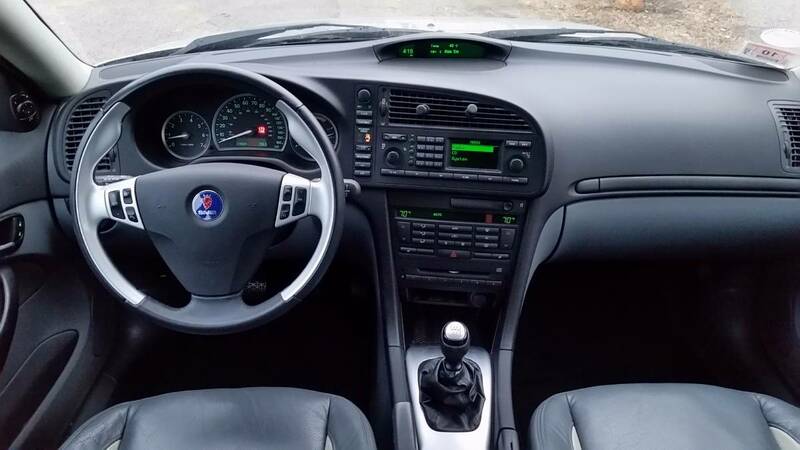 The 2000s Saab dash wasn't as inspired by jets crazy backwards as the early Saabs, but some of the quirky attitude comes through the cheap GM plastic. For some strange reason the 9-3 wagon was available with a 6-speed manual gearbox with the big engine, something you won't find very often. My wife and I test drove one of these when she was looking for a small wagon. They are great fun, with the usual caveat that goes with a deceased car company. Also, torque steer is us. Should get the Thorsday label but Vince did remember to include the badge. I could see myself daily driving one of these for a while. 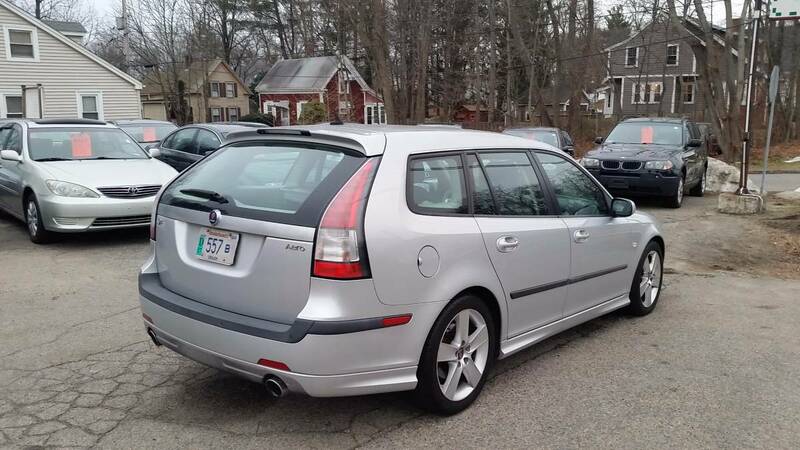 Volvos could be a gateway drug into Saab abuse. Hey, I represent that comment. Can anyone tell me the function of the button that shuts off all the dash lights except the speedo? My Nephew got a wagon like this for his first car but with an auto unfortunately. Does have some quirky issues. I have been patiently teaching him how to drive stick. The function is to be cool. It's a gimmick carried over from airplanes which I guess have a 'night mode' for their instrument displays that turns off most of the lights so you can see out the window better. I have a 1994 900SE and that button makes me giggle every time I use it. I turn to my wife and say ENGAGE NIGHT MODE and then push the button myself because she's rolling her eyes and pretending to be somewhere else. Saab engineers felt that other dash lights (apart from speed) were a distraction to the driver so they offered the blackout feature. Cool little wagon. Are there any aftermarket solutions to the torque steer? I had a couple of Alfa 164s, both 12v and 24v. For torque steer, they could be kept under control by keeping the front suspension bushes refreshed. I treated front bushes as std wear and tear items - every two years. As long as the bushes were in good condition, and the tyres were of good quality, torque steer was minimised. Stiffer rear suspension can help as well - the squat under acceleration lifts the nose, which does unattractive things to front suspension geometry, which exacerbates torque steer. That said, based on my V6 (non-turbo) 900SE I agree with BionicTorqueWrench that fixing the front suspension is essential. When I got my car, it needed new strut mounts, struts, ball joints, sway bar links, and control arm bushings. Fixing all of that has made a world of difference! Still a sharp looking, decade old wagon.